By Dulce Ruby / 29 August / Partnerships, Travel Stories / 0 comm. in all of our lives where everything begins to click for us. Anything that is no longer resonating with our frequency, serving higher good or purpose, just seems to just dissipate and be no more – while everything we dreamt would be, IS, and we begin creating/manifesting so many more opportunities to live a fantasy-like reality & dream even bigger. A few years ago, I was cruising through the commencement of this very point in my life (my awakening if you will). I had a clear knowing that I no longer wished to live in big cities modeling and aiming for fame, and meditation was beginning to take over my life (and trust me, no complaints!). 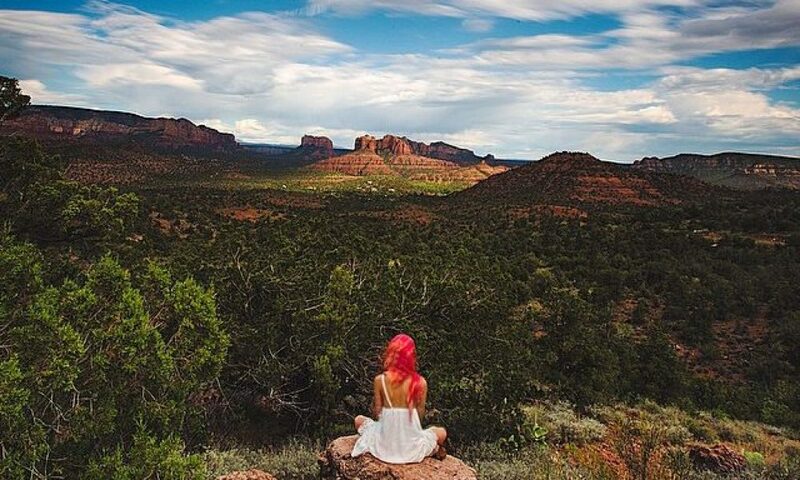 It was then that I was driven to the idea to go on a life-long journey; but first, I just ‘had to’ make my way back home to Arizona, head north and be present at the Sedona Yoga Festival. It’s funny how that works, isn’t it? How one thing, idea or mission turns out to be so perfectly aligned with all else – as if by divine timing or destiny. Having manifested the trip, made my way and aligned with the coordinators (Marc, Heather as well as Stephanie), I felt at peace and knew this was solely the beginning of so much more to come into fruition. The vision was there, it had always been. I love Arizona – it’s home and it’s magical – but even more so – Sedona is a place I can escape to & discover more of my Self and of the Universe, with each visit bringing to life new parts of mySelf and shining light on different aspects which need cleansing, healing, balancing, focus or simply… Peace & Love. 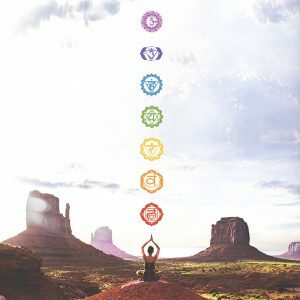 In short, am completely at awe with the energy Sedona holds, and as I was here amongst many others who too felt its pull – I knew one day, and soon, I would return to amplify that very energy. Life and the Universe conspired/happened soon after, and before you knew it I had started a brilliant Self-Development Program online for meditation through Peace Revolution (a project under the World Peace Initiative Foundation). After completing the initial 42-day Self-Development Program that they offer online (free of charge! ), felt beyond connected. I knew this had fallen into my life and path for something beyond that in which could be seen at this moment, and had a continuous strong feeling & knowing to fully confirm that very notion. I spent a few weeks in an intense (but pure & life-altering) meditation retreat and training with our beloved teaching Buddhist monks in Thailand. Joined together with 29 others from different countries all over the earth, it was an experience unlike any other I had yet had. Our days began before the sun rose; we meditated to welcome in the day and did yoga upon sunrise at the scenic view to welcome in the Light & Life. 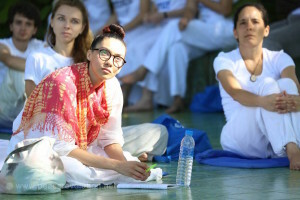 We bonded, took in lectures, did activities – all of which taught us valuable lessons – and of course, more and more meditations throughout the day. So much peace was harvested, grown and prepared to be shared as we all channeled to our purpose of spreading sustainable world peace. As the weeks past by, and my practice which had been put into motion for years now grew even more still & bright – I knew this was home. Beyond the beautiful views, people, energy and values – Peace Revolution, this group of people & organization, were precisely what and where I wished to be – and I was – and it all came together. I was going to be sure I was a big part of this project, and I was going to bring it with me as this ‘home’ was not a location, but more so a feeling of belonging, love of Self and others… this was PEACE. Weeks, months, and now years, passed. Travels to India to visit His Holiness for teachings, Mother Theresa’s House and tomb for further study and research, Swami Sivananda’s Divine Life Society, cleansings, more teachings, International Yoga Festival, Holi, temples upon temples – visits to sacred spaces and places all over the world to meditate and absorb all of the beautiful energy to eventually come back to reciprocate, reflect and share with the world – it all came down to this very moment, our NOW. Now here I am, grateful to announce and tell you all of the beautiful alignment which has come to be. I reached out to Sedona Yoga Festival not too long ago (after having been away on my personal journey since our last crossing), and told them all about my visions, and wishes to join forces of positivity, light, and love for PEACE – and of course, they are all in! We have now joined together and begun to organize in bringing what shall be the very first Peace In Peace Out (PIPO) event to the United States of America, and will be having a Global Peace Meditation this coming year at SYF! Am so excited and am ever so grateful for all of the magic that has come, and that shall be – thank you ALL for being here, now, with us. Do hope to see you all in person soon, raise vibrations & hold frequency together to aid in bringing world peace, home. From my journey, heart & Soul, to your own – may we see that we are all One. As an artist of written, visual and audio formats, Dulce Ruby aims to connect with & awaken the masses. Through exploration and expression of both inner & outer worlds (journeying both the world and within herself), she shares insight and content in regards to both spiritual & physical matters to aid others in their own personal healing. Via her site, present projects and collaborations with other influencers of our time, and usage of tools such as social media, she has been able to further extend her reach to well over a quarter of a million readers and fans across her network and continues to utilize these platforms for connectivity, reflection and service.